Truth Wins Out today called on Exodus International to shut down Desert Stream Ministries (DSM) following new revelations of sexual abuse with at least one minor. The admissions were made last week on the blog of DSM’ leader, Andy Comiskey (pictured), who is also the creator of the ex-gay program Living Waters. For reasons possibly related to this scandal, Comiskey moved Desert Stream from Anaheim to Kansas City, Mo., several years ago, where it currently remains in operation. In February 2008, Truth Wins Out produced a video featuring “ex-gay’ survivor Jaylen Braiden, who claims an Exodus team leader at Desert Stream took him advantage of him. Comiskey is one of the most influential ex-gay activists and groups use his curriculum, “Living Waters”, across the globe. 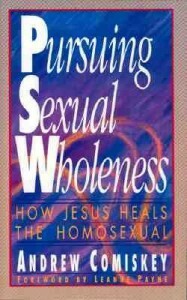 Comiskey is the author of “” and calls homosexuality “spiritual disfigurement.” His book also indulges in “spiritual warfare”, calling homosexuality satanic. So far, Exodus has failed to comment on Desert Stream’ troubles, nor has it moved to either suspend or close down DSM. After stonewalling for more than six months, Exodus finally cut ties with Lansing-based Corduroy Stone last after charges of impropriety were made last year by Patrick McAlvey in a Truth Wins Out video. Truth Wins Out is a non-profit organization that defends the gay, lesbian, bisexual and transgender community against anti-gay misinformation campaigns, counters the so-called “ex-gay” industry and educates about the lives of LGBT people. Our goal is to help individuals be true to themselves and lead genuine lives of honesty and integrity.